Ruby is sired by 102.25" TTT and 119.25" TH, Cowboy Tuff Chex, the longest tip to tip bull in the breed whose sire is the amazing 77.8750" TTT, Cowboy Chex. Cowboy Tuff's dam is 97.50" TTT and 118"+ TH, BL Rio Catchit, the first cow to go over 90" TTT in the breed and whose sire is 80.8750" TTT, JP Rio Grande. 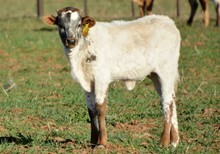 Now, Ruby's dam is 82.25" TTT, SL Selena's Ace, who is sired by 82" TTT, Temptations The Ace. Plus her pedigree is filled with females that are known for being great mothers in every way and have lots of twists. All of Ruby's offspring will be Millennium Futurity eligible.